It’s keen to be green! Welcome to Eco Match, where it's keen to be green! In these times of global climate change, the earth needs a helping hand. Use your matching skills to identify and react to environmental concerns in every nation of the world. As Director of the newly formed World S.A.F.E. organization, you'll receive reports of potential threats to the planet allowing you to take "eco-logical" action! 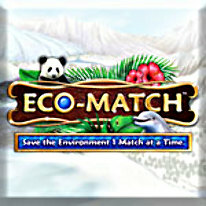 Play to restore the earth's fragile balance in Eco Match.